we are leading suppliers & exporters of Zoledronic Injection/ medicine name tablets/capsules or injection in China, Russia, Hongkong, Bulgaria, Romania, India. Description - The Brand name of this medicine is Natzold . 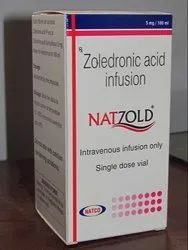 Natzold medicine contains generic Zoledronic Acid . Zoledronic Acid are available in form of Injection. Each Vial contains 5Mg Zoledronic Acid. One Pack of Natzold contain 1 Vial. Manufacturer & Marketed company name of Natzold is Natco Pharma Ltd, India. USED - Natzold Infusion is used in the treatment of osteoporosis. It treats osteoporosis in postmenopausal women and men at high risk of fractures. Warning: Natzold medicine out of the reach and sight of children and away from pets, never share your medicines with others, and use this medication only for the indication prescribed. The information contained herein is not intended to cover all possible uses, directions, precautions, warnings, drug interactions, allergic reactions, or adverse effects. Description - The Brand name of this medicine is Zoldonat . Zoldonat medicine contains generic Zoledronic acid . Zoledronic acid are available in form of Injection. Each Vial contains 4Mg Zoledronic acid. 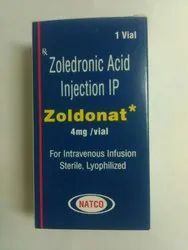 One Pack of Zoldonat 1 Vial. Manufacturer & Marketed company name of Zoldonat is Natco Pharma Ltd, India. Dosage- As Directed by Oncologist. Warning: Zoldonat medicine out of the reach and sight of children and away from pets, never share your medicines with others, and use this medication only for the indication prescribed. The information contained herein is not intended to cover all possible uses, directions, precautions, warnings, drug interactions, allergic reactions, or adverse effects. Description - The Brand name of this medicine is Zoldria . 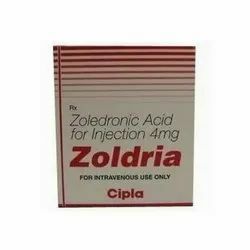 Zoldria medicine contains generic Zoledronic acid . Zoledronic acid are available in form of Injection. Each Vial contains 4Mg Zoledronic acid. One Pack of Zoldria 1 Vial. Manufacturer & Marketed company name of Zoldria is Cipla Pharma Ltd, India. USED - Zoldria 4 mg Injection is used to treat or prevent osteoporosis in postmenopausal women. It is also used for the prevention and treatment of osteoporosis in men and women who are on corticosteroid therapy. Warning: Zoldria medicine out of the reach and sight of children and away from pets, never share your medicines with others, and use this medication only for the indication prescribed. The information contained herein is not intended to cover all possible uses, directions, precautions, warnings, drug interactions, allergic reactions, or adverse effects.